You don’t need us to tell you that turbochargers are hot. The word on the street is as enticing as it is simplistic. Just stick a turbo on it and you’ll make ridiculous horsepower. We once asked the guru of engine power, Kenny Duttweiler, “How much power can we make with a turbo on a 6.0-liter LS?” His answer was succinct: “How much do you want to make?” That meant that four digit power numbers are achievable. However, in the vein of full disclosure, this won’t be an easy, bolt-on, walk in the park process. If you are motivated, it’s well worth the effort. 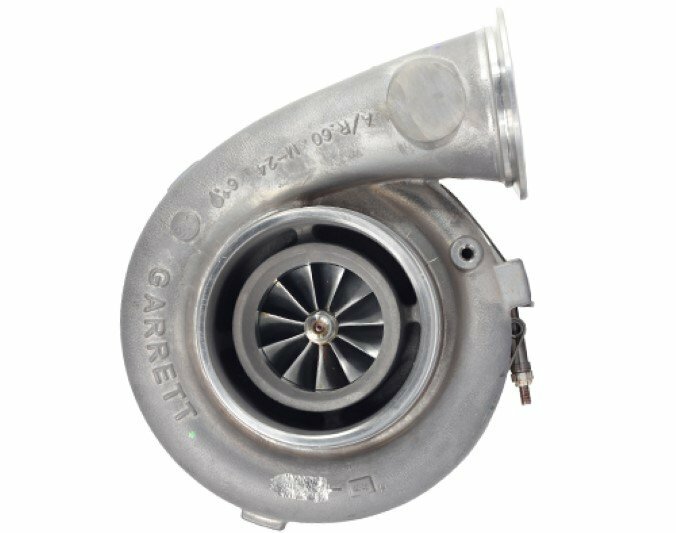 We latched on to the learned souls at Garrett Honeywell, who can trace their turbocharger lineage all the way back to 1936; it’s quite obvious they know a little bit about turbochargers. Our story starts with someone who had already taken a stab at adding a turbo to a 6.0-liter LS engine for a street car. Several years ago, Justin Nall decided that a single turbo pushing air into a used, iron 6.0L truck engine seemed like a good idea. His machine is a choice, Lemonwood yellow ’66 Chevelle with a 4L80E automatic, a decent PTC converter with 3,400 stall, and a 12-bolt rearend filled with a 3.31:1 ring-and-pinion. The car is not particularly light at 3,850 pounds. The engine sports 364 cubic-inches, with a Comp camshaft measuring .598-inch of lift on the intake and .591-inch of lift on the exhaust, with 234 and 230 degrees of duration at 0.050-inch, respectively. Other components include: Wiseco 10.4:1 pistons, a set of CNC-ported production 243 heads, an Edelbrock Pro Flo intake, and a stock truck throttle body. Overall, the combination is fairly mild. Nall lives in Minnesota, so he puts plenty of miles on his hot rod during the summer months. Justin Nall’s ’66 Chevelle is a regular competitor on autocross courses, as well as spending lots of time on the street. He was looking for an upgrade for his current turbo, so we plugged some numbers in to choose a little bigger turbo. 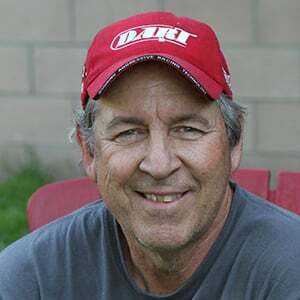 At the Summer Nationals event at the state fairgrounds in nearby St. Paul, he also has run the car on the chassis dyno. His initial turbo package was intended as a conservative choice to dip his toes in the turbo waters. 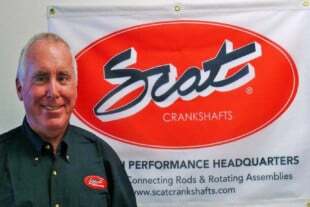 Lately he’s decided to up the game with more horsepower, so we thought this would be an excellent way to blaze a trail toward a more aggressive turbocharger. The Chevelle was previously capable of over 650 rwhp, and his goal was to push this to 900 flywheel horsepower; that puts wheel power around 800 to the rear tires. His fuel of choice is E85, because it offers roughly 105 octane, and the engine really loves how the fuel cools the hot compressed air exiting the turbo. We accessed Garrett’s website, and discovered a wealth of technical information that is divided into areas depending upon your technical level of understanding. If you are just getting into this, then the Basic area will deliver important foundation work for you to understand the concepts. The website also offers intermediate and advanced areas as well, so you can jump right into the area where you are most comfortable. If you don’t want to run through the math, Garrett also offers its Boost Adviser, which makes the selection process a bit easier. But it’s still a good idea to read this story, because along the way we will explain what all the terms mean and how they are used to help choose a turbo. Many of the details we will discuss here are based on knowing your way around a compressor map. If you’re not familiar with what this is, it’s important to do a little homework by reading all about this on Garrett’s website. But we’ll hit the highlights for you here. This is the engine in Nall’s Chevelle. It is a basic 6.0L iron truck block engine with a mild Comp roller, 10:1 compression, a set of ported 243 LS1 heads, and an Edelbrock Pro-Flow intake. A compressor map is a basic X-Y coordinate graph, yet it offers a tremendous amount of important information. The horizontal (X) axis of the map is expressed in airflow in pounds per minute (lbs/min). This is the amount of mass airflow the turbocharger can move. Obviously, the larger the compressor housing of the turbo, the more air it can move. There’s a simple trick that everyone uses when reading the airflow portion of this map. The pounds per minute of air increases moving left to right. If you multiply the lbs/min number x 10, that will roughly represent the amount of horsepower that airflow can deliver. So for our goal of 900 hp, this would be represented by 90 lbs/min of air. The vertical (Y) scale is expressed as a pressure ratio. This isn’t just that number times sea level air pressure (14.7 psia), but it’s very close. 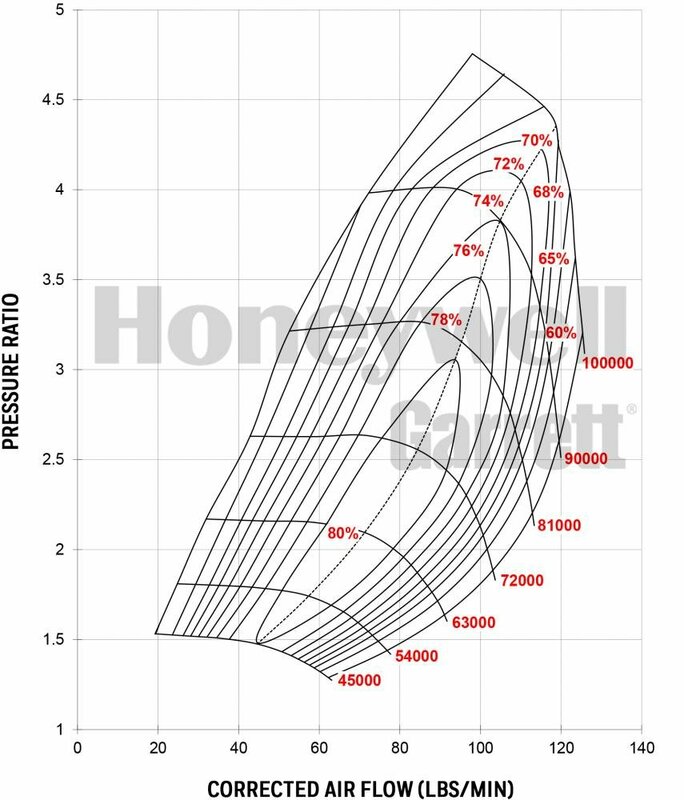 One way to explain this is the pressure ratio is derived as the pressure expressed on your boost gauge divided by the ambient air pressure. If we saw 44.1 psig on our boost gauge and this occurred at sea level with an ambient air pressure of 14.7 psia then dividing 44.1 by 14.7 would equal a pressure ratio of 3.0. Note that we expressed the above ambient air pressure as 14.7:1 psia. The “a” in psia means absolute pressure. The “g” in psig means pressure as read on a gauge. A typical boost gauge represents ambient air pressure as 0, which is why we have to label the pressure we are talking about. In absolute terms, 44.1 psig is 58.8 psia in absolute pressure (14.7 + 44.1 = 58.8). This will become important once we start wading through the formulas. But don’t worry – it’s not that difficult. So for Justin Nall’s Chevelle, we’re looking to size a turbo with Garrett that will deliver around 900 flywheel hp. To determine how much airflow we will need, Garrett recommends starting by calculating the actual mass airflow. This will reinforce what we just did with the short-cut but it’s worth running through the numbers. The initial mass airflow calculation uses several variables that we need to know. The first is our estimated horsepower, which is 900. Then it asks for the projected air-fuel ratio and the brake specific fuel consumption (BSFC) number. The BSFC number represents the pounds of fuel consumed per horsepower per hour (lbs/hp/hr). A good, late model naturally-aspirated engine on gasoline will use around 0.45 lbs/hp/hr of fuel. As the number becomes smaller, that means the engine is more efficient and uses less fuel to make the same amount of power. Because Nall is using E85, which is 85-percent ethanol, this fuel has a lower specific heat content which means we must burn more fuel to make the same amount of power compared to gasoline. So for E85, the BSFC number we will use is a 0.60 number. This means we’re using roughly one-third more fuel to make the same horsepower. This sounds terrible—and it is, if we were in a fuel economy race. But since Nall is focused on making horsepower, this isn’t all that bad. Plus, with a turbocharger, we must add additional fuel to make sure the engine does not experience a lean air/fuel ratio that could damage parts. So add all that up and a BSFC number of 0.60 will work for this application. If we were planning on using a high-octane gasoline, a BSFC of 0.55 would be better. This calculated number is what we will use to reference mass airflow on the compressor map. Since we’re only using one turbocharger, our goal will require a rather large compressor to move all this air. If we were going with a twin-turbo package, then this number would be divided by two. This is a typical compressor map. 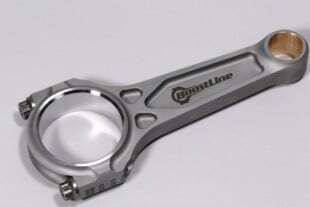 In this case, it is for the Garrett GTX4508. We will use this map to show the mass airflow rate across the X (or horizontal) axis of the map. These values are mass airflow expressed in pounds of air per minute (lbs/min). The Y (or vertical) axis is the pressure ratio, which is essentially the discharge boost pressure divided by ambient air pressure. As you will learn in our story, this value is P2c divided by P1c. In our case, follow 108 lbs/min to where it intersects with roughly a pressure ratio of 3:1. You will see that this falls in the 78 percent efficiency range, which is pretty good. Now that we have our lbs/min airflow requirement, we can move to Garrett’s next step, which is to calculate the Manifold Absolute Pressure requirement. This is possibly the most complex part of this entire selection process, so we’ll take it nice and easy here. The variables we will need to put into the equation include the displacement in cubic inches (364ci), the maximum engine speed in RPM (6,500), the engine’s volumetric efficiency (VE) that we’ll discuss in a moment, and the intake manifold inlet air temperature in degrees Fahrenheit (150°F). The proposed inlet air temperature is high, since we’re going to calculate this assuming we’re not running an intercooler. Big power numbers with high boost often demand an intercooler, but to keep things simple, we’re going to assume that the E85 will help cool the incoming air, so we’re going with the 150°F number. If we lowered this inlet air temperature, this would lower the calculated boost pressure required, so in a way, we are being conservative. Garrett also supplies useful graphs like this one that shows the turbine or hot side airflow of two different A/R ratio turbine housings. The red line shows an 84 trim turbo with a 1.01 A/R housing compared to the same 84mm trim with a 1.15 A/R. The larger 1.15 shows increased airflow capacity but would tend to spool slower than the smaller A/R housing. Volumetric Efficiency (VE) also demands some explanation. This is a number that we will use to determine the capture ratio of the air flowing through the engine. 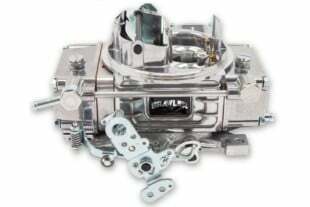 Because of mechanical inefficiencies, a basic street engine is not going to be 100-percent efficient in using all the air that flows past the throttle body. We’re going to put the VE number at 88-percent – which means we’re not going to capture that last 12-percent of air. As an example, if we have a cylinder that was completely filled, it could capture 10 lbs/min of air, but the reality is it will only be able to retain 8.8 lbs/min. This has a direct bearing on how much power we can make, so a smaller number will be more conservative, while a larger number decreases the amount of air we need to make the same power. The temperature required for the calculation will use Kelvin, which is absolute temperature, so to convert from degrees Kelvin to degrees Fahrenheit, we have to add 150 to the Kelvin standard of 460. Plus we are also going to use a gas constant (which is 639.6) to make the equation work. Don’t ask why this is important – that’s another story entirely. This is Garrett’s GTX4294 or very similar GTX4202R turbocharger. It is sized slightly smaller than in mass airflow than our calculated numbers but would be a good choice for an initial buildup of a stout 6.0L engine for the street. Options also include sizing the turbine housing which affects how quickly the turbo will spool up to make boost. The result is expressed as absolute pressure (psia). Justin Nall lives in Minnesota, where we found an average atmospheric pressure number for his area of 28.92 inches of mercury which equates to 14.46 psia. Standard sea level pressure (for comparison) is 29.92 inches of mercury. So if we take our calculated 40.48 psia and subtract the ambient air pressure of 14.46, this will give us 26 psig—or the reading we will see on the boost gauge. This would be the theoretical maximum boost required to make 900 hp. This next step is to calculate the amount of pressure loss that the system will experience between the discharge side of the compressor and the intake manifold inlet. If we were using an intercooler, we would need to know how much pressure would be lost pushing the boosted air through the cooler. But since we are assuming no intercooler here, we can use a basic 1 psi loss of pressure between the compressor outlet and the intake manifold inlet. It’s called P2c because it’s the pressure of the outlet. It might be helpful to compare this compressor map of the GTX4202 to the previous GTX4508 map. You can see how the larger 4508 version will move more air but will likely be slightly less responsive at lower engine speeds due to its size. If you remember earlier in this story, we looked at compressor maps and how the vertical scale is expressed in Pressure Ratio. That’s what we will calculate next. This is actually fairly simple because all we’re doing is dividing the discharge pressure by the inlet air pressure. This will be the pressure ratio that we will plug into our compressor map. We now have all the data required to plug into a typical compressor map. Unlike the classic pirate movie where X marks the spot of where to dig for the treasure, there are literally several compressor maps that would appear to work with the numbers that we’ve generated. The main inputs again are our 108 lbs/min of air required along with a pressure ratio of 3.08. But keep in mind that these are the peak numbers. There are other factors that will have an effect on how the turbocharger operates within the system. Justin’s experience has shown him that among the more important variables is exhaust backpressure. All turbos generate backpressure and this is especially true with turbos for the street where the exhaust housing is generally sized smaller to help the turbo spool quicker. This relates to what is called the A/R ratio that relates to the size of the exhaust housing. Larger A/R housings reduce backpressure but also tend to spool slower. According to Garrett, A/R (Area/Radius) describes a geometric characteristic of all compressor and turbine housings. Technically, it is defined as: the inlet (or, for compressor housings, the discharge) cross-sectional area divided by the radius from the turbo centerline to the centroid of that area. While we estimated inlet air temperature for our turbo selection without an intercooler, you can see in this photo that Nall uses an air-to-air intercooler. As a very rough estimate, you can expect a quality intercooler to experience roughly a 10-percent pressure drop, which means at a 20 psi inlet pressure at the intercooler you might see a loss of pressure to 18 psi. This is a generic estimate and is affected by a number of variables. After we produced our numbers, we searched through quite a few turbochargers and selected a turbo that we thought would work – a GTX4508. We shared our numbers with the Garrett engineers and they matched a GTX4294R and a GTX4202R to our application. The engineers said the numbers place the turbo selection somewhere between these three turbos. Garrett’s selection is a more conservative choice than our estimate for the Chevelle and much of this could be considered a compromise between ultimate power and decent manners on the street. Garrett’s recommendation is based on much more direct experience and therefore carries significantly more weight. The 4202R employs a 76mm inducer and a 102 mm exducer sizes while the larger GTX4508R is sized up with an 80mm inducer and 106mm exducer. The larger wheel means it will spin up slightly slower. In comparing the GTX4202R to the GTX4508, the more aggressive 4508 moves more air, which moves the chart more to the right. This will make more peak power but likely will not come up on boost as quickly, all else being the same. We don’t have the space here to get into how altering the turbine section might be able to help that, but this also means likely changes in backpressure as well. As you can surmise, there’s more than a bit of effort involved with choosing a turbo and there are many other variables that we have not discussed. Hopefully this exercise in turbo matching has helped take some of the mystery out of homing in on the right turbocharger. You might want to run through more than one scenario just to get comfortable with the numbers. Have fun with it and see how changing the numbers has an effect on these boost devices. You can also use the Garrett Boost Adviser program to generate the calculations so you don’t have to slog through all the math. Boost Adviser will ask a few questions and then provide some turbocharger matches based on your input. You can also take the calculations and compare points on the compressor maps to find the selection that suits your application. All this may appear intimidating at first, but as you work with it and as you learn more about how turbochargers work, more of it will make sense. All these calculations are intended to remove the black magic from choosing a turbocharger.